Hey, Egypt! Here We Come! 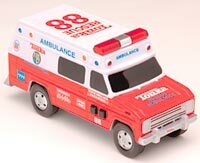 One not so beautiful afternoon, while David was sitting in the middle of the floor playing with his toys, he noticed Tommy's new toy ambulance. It was so cool, because it made the noises of the sirens and the horn, and even spun the tires! 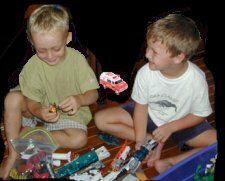 Meanwhile, Tommy was finishing a block building that he had been working on and didn't see David pick it up. David pushed one button after another. "VROOM! VROOM! HONK! HONK! WOO! WOO!" the noises continued. Just a few moments later, Tommy heard an awful sound. "CRASH! SCREECH! CRUNCH!" He looked over at David immediately. He screamed at the top of his lungs, "YOU BROKE MY FAVORITE TOY!!! Why would you do that? It was my absolute favorite because it's brand new. How am I ever going to get another one?" David tried to explain, "It was only an accident. I didn't mean to break it; I was just playing with it. I'm sorry." Tommy angrily replied, "Sorry is just not good enough! Sorry doesn't get me a new ambulance with all the cool buttons and noises, now, does it?" David didn't know what to say. He certainly couldn't replace it. He couldn't ask his mommy to go buy a toy for his friend. David thought and thought, but he couldn't decide on a good plan. He just wanted to make it right, but Tommy simply would not listen. When David received his allowance money a few days later, he begged his mommy to take him to the store. After she was finished shopping, he said, "Mommy, Mommy! I want to go get a toy." She replied, "You've been such a good boy this week. I suppose we can look for a few short minutes." "I know exactly what I want to get. This won't take long at all," he stated positively. "I need to see the cars." His mother frowned and replied, "Don't you think you have enough cars? Maybe you should	consider a game you could share with your brother." David insisted, "I need a new ambulance! You know, the one that makes all the noises and has all the buttons. That's the one that I need." His mother asked, "You don't want it only because Tommy has it, do you?" "NO!" David said emphatically. He quietly continued, almost in a whisper, "I need to replace his." David shyly began to relate the story. "I was playing with it at his house a few days ago, and I . . .." He stopped to clear his throat. He was so upset, he was now whimpering, almost in tears. "Go on, David," his mommy encouraged. "It's okay. Just tell me what happened." "Well, I. . . I . . . I started pushing all the buttons just as fast as I could, and I . . . uh . . . I broke it! I broke Tommy's toy! I broke his favorite ambulance." "Did you say you were sorry?" Mommy asked. "Yes, but...." He was so sad he couldn't continue. "But he was still mad, so I thought that if I bought him a new one he would play with me again and would be my friend," David replied. "Well, that's a nice thought. You think that if you are nice to Tommy, he will forgive you for breaking his toy," she stated. "Is that what it is?" David asked, confused. "Yes," Mommy stated. "When we do something wrong and we say we're sorry, the other person should forgive us." "Well, I sure hope Tommy forgives me!" David exclaimed. The next day, when David gave Tommy the new ambulance, Tommy grinned from ear to ear. Then he did a very surprising thing. He handed it back to David and said, "You keep it. I want to be friends even though you broke my toy. I know it was only an accident and I forgive you." He continued, "Will you forgive me for getting so upset yesterday?" "Yes. Of course, I forgive you! That's what we are supposed to do when somebody does something wrong to us. Even if we don't feel like it, we should always forgive each other," David finished. They were both happy that everything worked out so well. Joseph's brothers chattered almost non-stop all the way back to Canaan. They were so caught up in their excitement, that they hardly noticed the hot, dry, barren, miserable desert. They couldn't believe their good fortune.... They couldn't believe that their little brother had become an important ruler in the land of Egypt. For that matter, they could hardly believe he was still alive. "Are you sure it was really Joseph?" one of them asked in disbelief. "It had to have been him," Reuben replied. "How else would he have known us from the oldest down to the youngest?" "Besides," said Dan, "who else would have given us so much food and so many gifts to bring back home?" "Remember, I'm the one that was in prison waiting for-ev-er for you guys to come back for me!," Simeon piped up. "His servants treated me very well . . . uhmmm . . . very well for a prison, that is," he added. As the conversation went on and on, there was no other conclusion to be made other than that he had to have been Joseph. Nearing their home, their excitement grew even greater. Their voices reached a fevered pitch as they argued about who was to be the first to tell their father about the feast, and about the silver cup, and . . . that their brother Joseph was alive and well. Jacob had been anxiously awaiting the return of his sons. His hope that Simeon would be returned was mingled with fear that something dreadful might have happened to Benjamin. Hearing what sounded like loud, angry voices, he moved as fast as his elderly body would let him, his fear escalating. He breathed a sigh of relief as he counted and realized that his eleven sons had all returned to him. "At least they are safe," he thought. "Whatever they are arguing about is not important." "DAD! 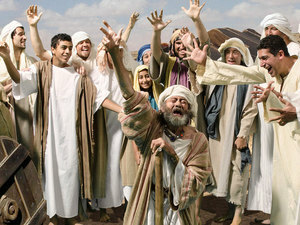 DAD!," they shouted when they saw him coming toward them. "WE HAVE THE MOST WONDERFUL NEWS!" When Jacob heard that, he relaxed a little more, but curiously wondered what they could be talking about. All the brothers were shouting and talking at the same time, and none of it made any sense. "Calm down . . . ALL OF YOU!" He had to shout to be heard. The brothers were so excited they couldn't contain it. When they had finally calmed down a little bit, Jacob asked, "Now what is all this good news you are clamoring about?" The brothers all continued talking at the same time, and Jacob heard something about a feast and something about a silver cup, but the thing he heard that made him freeze in his tracks, was the name of his dearly loved son, Joseph. "FORGET EVERYTHING ELSE," he shouted. "What is this you have to say about Joseph?" The brothers tried to tell him Joseph was alive, and that they had talked to him. That was such startling news for the old man, he almost lost his balance and had to be helped to a nearby boulder to sit down. "WHY ARE YOU MAKING JOKES ABOUT THINGS LIKE THIS?" he cried angrily. "YOU YOURSELVES TOLD ME MANY YEARS AGO THAT JOSEPH WAS KILLED BY A WILD ANIMAL!"
. . . But down the road, just a little way behind the brothers, he saw something that made him lose all doubt. "THE WAGONS ARE COMING!" he shouted. "AND LOOK AT ALL THOSE DONKEYS LOADED WITH GOODS! IT IS JUST AS YOU SAID! ONLY JOSEPH WOULD DO THIS AND SEND SO MANY GIFTS! HE MUST BE ALIVE! I MUST GO, SEE HIM." It was all so unbelievable. Jacob was beside himself with joy. Jacob commanded his sons to gather all their herds and flocks, and load the wagons with their wives, their children, and their food for the trip. All together, 66 descendants of Jacob, not counting the wives, were going on the l-o-n-g trip to Egypt. The brothers obediently did all they were told and also made an especially comfortable place in one of the wagons for their father. They traveled the same hot, dry, dusty paths they had taken on their two previous trips to Egypt. They stopped to make camp overnight at a place called Beersheba, and Jacob made sacrifices and worshipped God. During the night, God spoke to Jacob. "Here I am," Jacob replied to God. "I am the God of your father Isaac and of his father Abraham. Don't be afraid to go to Egypt. I will be with you and I will make your children and grandchildren a great nation. Joseph is alive and you shall be with him," God said to Jacob. Jacob was thankful that God had spoken to him and reassured him that all was well, and he was doing the right thing. He slept peacefully the rest of the night. Jacob and all his sons and their families arose early in the morning to continue their journey into Egypt. 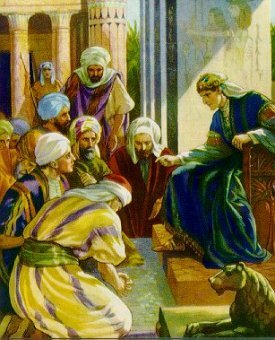 Jacob had appointed Judah to go ahead of the group to see Joseph and tell him they had arrived. Joseph prepared his chariot and practically flew to see his father. After he had introduced himself, he threw his arms around his father and hugged him and wept for a good while. Jacob was convinced that it truly was his son Joseph and he was now content and free from fear. Joseph told the group they were all going to go meet King Pharaoh. He instructed them as to the proper courtesies and what they should say to answer Pharaoh's questions. 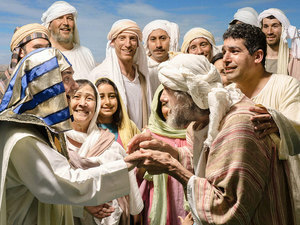 Joseph led the group to the palace to introduce them to the King, and the King was overjoyed to finally meet Joseph's family. Pharaoh couldn't speak to them directly because they spoke different languages, so he communicated through Joseph. "Tell your father that all of Egypt is open to them. Make sure they settle in a place with good land and water." Then Pharaoh turned to Jacob and, speaking through Joseph, asked how old he was. Jacob replied that he was 130 years old. Then Jacob prayed a blessing upon Pharaoh, and they went out to settle in the land of Goshen. Jacob, who was also known as Israel, and his sons, who were also known as the children of Israel, grew very prosperous in Egypt. Jacob lived 17 more years and grew older and weaker. He gathered all his sons around him and prayed a blessing over them, naming each one individually. He also prayed a blessing over Joseph's two sons, Manasseh and Ephraim. After all the blessings were prayed and instructions were made, Jacob quietly went to sleep and died a peaceful death. Joseph, his family, and even Pharaoh and the whole land of Egypt mourned 40 days for Jacob. After their father Jacob died, the brothers started thinking of the past and became very worried. They were afraid that Joseph had only been kind to them on account of their father. They concocted a plan and made up a lie. Then they hired a messenger to go ahead of them to speak to Joseph. "Your father had a command for you before he died," the messenger said. "He wanted you to forgive your brothers for the evil things they did to you." The brothers then bowed on the floor before Joseph, begging his forgiveness. Joseph looked at them sadly and deeply troubled. With tears in his eyes, he asked, "Do you really think I want to pay you back evil for evil? I have no grudge against you. How can you even think such a thing? I have no desire to do anything bad to any of you," he continued. "You think you were bad to me and your conscience is bothering you, but God had a plan. God wanted me here in Egypt to save you, your families, and many, many other people from starving, and he used you to get me here. There is no need for you to fear me. What you meant for evil, God meant it for good. I will take care of all of you and your families," he spoke to them kindly. Joseph and his brothers lived the rest of their lives prosperously in the land of Egypt. What good news did the brothers have for their father? Why did their father have trouble believing them? What did Jacob do when they stopped at Beersheba? Why didn't King Pharaoh speak directly to Jacob? How many sons did Joseph have? Why did the brothers become fearful of Joseph? What was Joseph's attitude toward his brothers? God can make even bad things turn out good. "You thought evil against me; but God meant it unto good" (Genesis 50:20). to be kind and to forgive others. In Jesus' Name, amen.